Disclosure: I am not an affiliate or employee of Libre Office or The Document Foundation. The following is an independent opinion for which I have not been compensated in any fashion. If you are looking for a suite of programs to replace Microsoft Office, look no further than Libre Office.You can read more at the official Libre Office website and on Wikipedia. 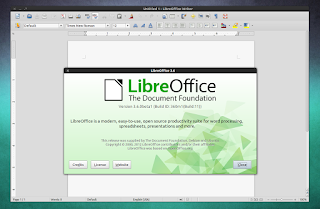 Libre Office looks and feels like Microsoft Office and supports documents created in Microsoft Office. It is 100% free. My son told me about Libre Office a couple of months ago. I admit that I was afraid to try it at first. I have been using Microsoft Office literally since the early 1990's. However, once I finally downloaded the program, I was sold. The greatest part about being sold (aside from how well Libre Office works) is the fact that it cost me nothing. If you click the image above, you'll be taken to the official Libre Office download page. Always use the official product page to download any software. If you google the software you want to download, you will find multiple links. Many such links contain malware. Never trust them. Always use the official link. Try Libre Office for yourself. Like me, you may be pleasantly surprised.